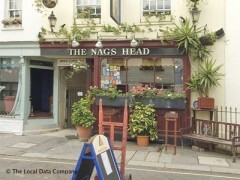 About: Situated in a mews The Nags Head has managed to keep some sense of its originality with its flagstones, fireplace and oak panels. There is also a cosy back room for more private drinking. Music from the 1920s and 1930s is played as entertainment. They serve a variety of traditional English dishes as well as a buffet salad bar and can cater for private parties of up to 100 people. They also provide outside seating on the terrace. The person owning the pub, a short-hair blonde woman, has definitely no place in the Hospitality business. It is a real Tragedy!!! To avoid at all costs. Promising pub at first glance. Nice oldy worldy feel as if you were in the country. HOWEVER, after we'd finished our first pint, and were deciding what to have next, the bar maid came round and told us to buy another drink or give up the table. We wanted another drink so we got one (regret that now). After our next drink, when we sat there finishing our conversation without a drink for a couple of minutes, a different barmaid hollered from behind the bar to three new people that had come in, "you will be able to have that table as they don't have a drink and are therefore leaving"!!!! I have never been treated so rudely in any pub in my life. All at £3.60 a pint!! Rubbish.